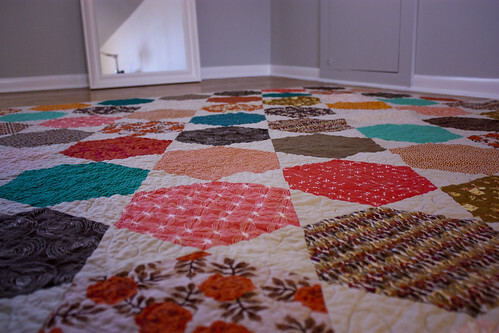 Six months and 12 bobbins of quilting thread later, the Penny Patch Quilt is finally finished! 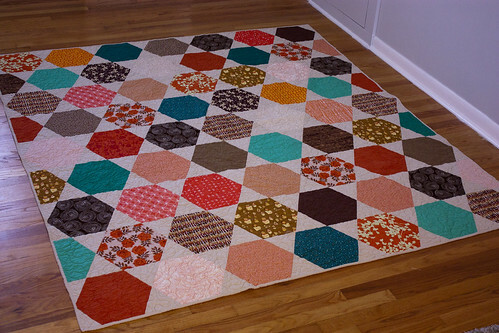 I made this twin-sized (66" x 90") quilt closely following the instructions on Stitched in Color's Penny Patch Quilt Along. I spent an afternoon selecting, cutting and pairing fabric for each block back in October and then finally started piecing the top in January. 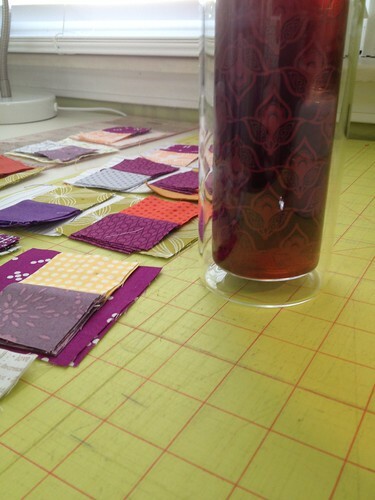 I really like the mix of fabrics I chose for this, especially because I'm on a purple kick right now. 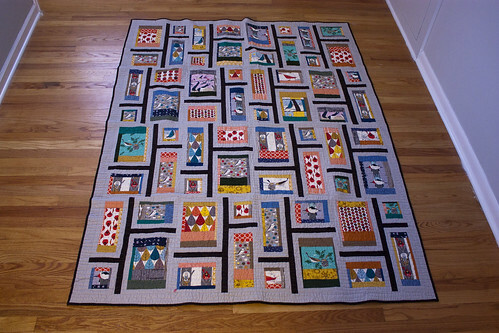 After the quilt was basted, it hung on my sewing room door for 2 months while I practiced doodling dogwood quilting during meetings and on phone calls. Once the pattern finally clicked for me, it took a few weeks to pull out the big guns and attempt using my sewing machine. A week ago, I finally took the plunge and quilted the first two lines on the quilt. It wasn't as bad as I thought it would be and I definitely shouldn't have procrastinated so long on this! My dogwoods aren't anywhere near perfect and not one looks alike or is uniform in size, but I'm pleased with the overall look and I'm glad I reached outside of my comfort zone. 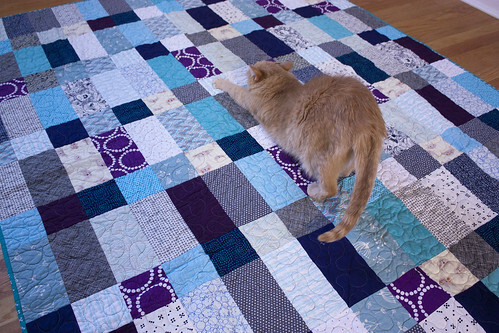 My shoulders are still sore after all of the maneuvering, so it will be a while before I attempt a large scale free motion quilting job again. 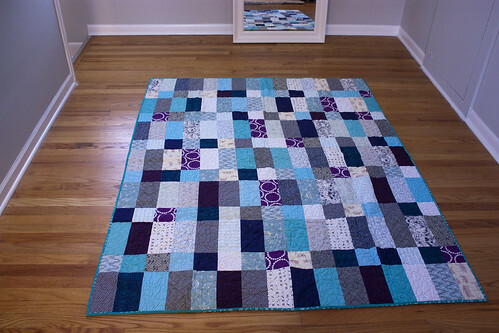 I modified the pattern in the tutorial a bit by adding alternating rows of four-patch blocks. The tutorial pattern used a checkerboard pattern of single square and penny patch blocks, but I added the four-patch blocks to try and avoid some of the stair-stepping patterns that you see above. 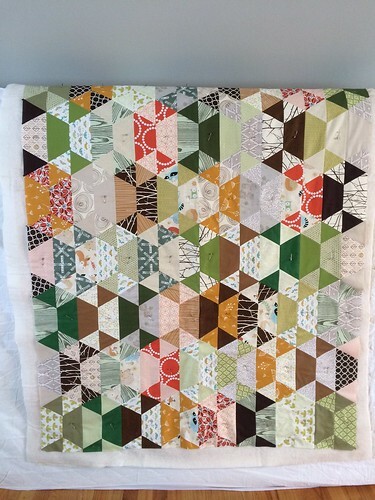 If I were to make this quilt again or offer suggestions to other quilters interested in this pattern, I would use a selection of medium tone fabrics rather than a mix of low-volume and high-volume fabrics. I think it would lend to a more vintage look and avoid the stair step pops of high intensity colors. It's not as noticeable up close, but the "steps" do pop at a distance. As soon as I pulled it out of the dryer and took pictures, I tossed the quilt on a chair. When I turned around, I found Nuku Nuku had already claimed her spot. I'm glad she loves this one as much as I do! My middle sister, Ruth, graduated from college last December. I, not so sneakily, asked her for her 3 favorite colors and she sent me a swatch with gray, light blue and royal blue. 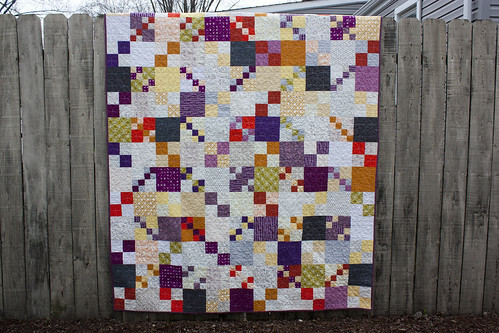 I pulled together a ton of fabrics in her palette and created a simple patchwork quilt based on this one I saw on Pinterest. 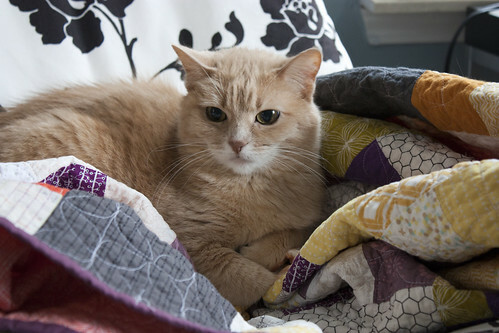 Ruth and her husband have 2 super sweet cats and a big dog, so I made sure to include some catnap fabric and some dog fabric in the mix. 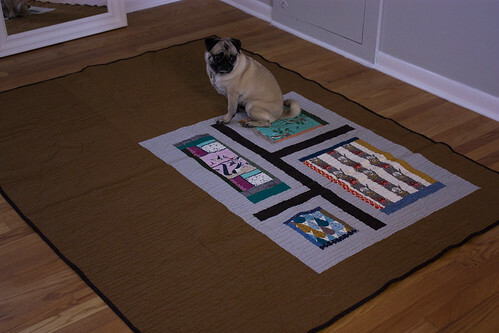 The feline and canine cousins both gave this quilt the Craft family seal of approval! 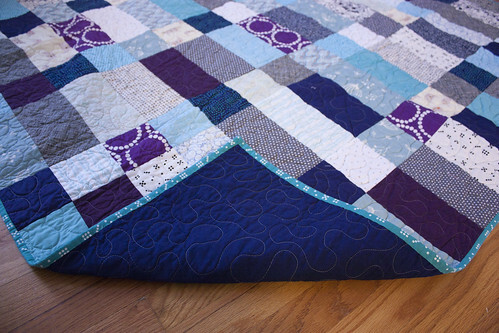 The backing is a solid royal blue, with meandering stippling in white thread. 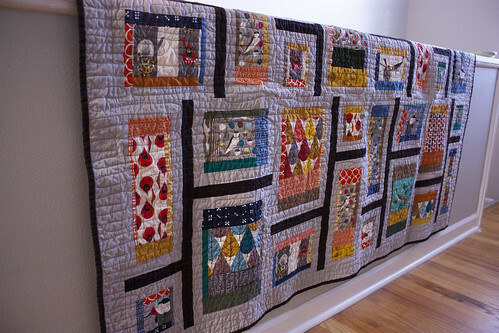 The whole quilt is about 64" x 80". My sister is super tall and this covers her up quite nicely. I've become slightly obsessed with hexagon designs lately. 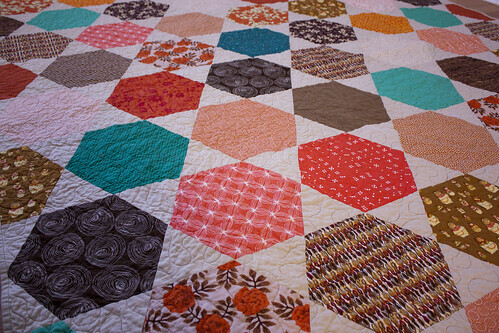 What I really want to make is a giant English paper pieced, Grandma's Flower Garden quilt, but because I don't want to devote that much time to hand sewing, I've settled on larger scale hexagon patterns. 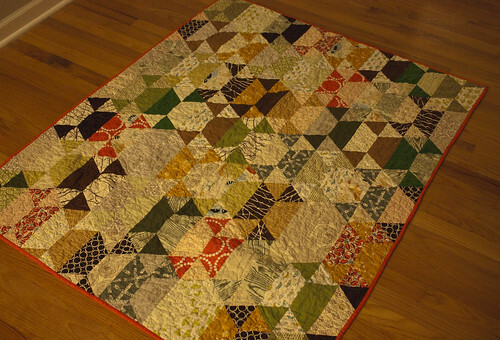 This particular quilt used the Rosalie pattern card from Valori Wells. I made the larger version, 78" x 86". 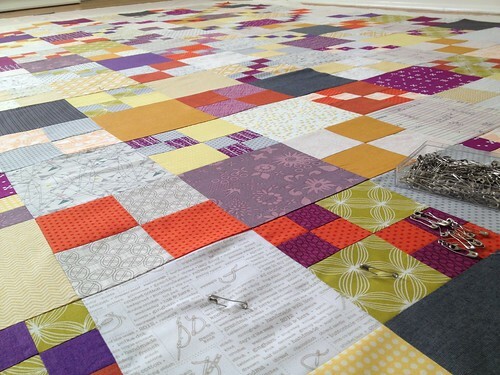 I usually start my quilts by putting together a palette of fabrics I like. Then, I search for a pattern to use. 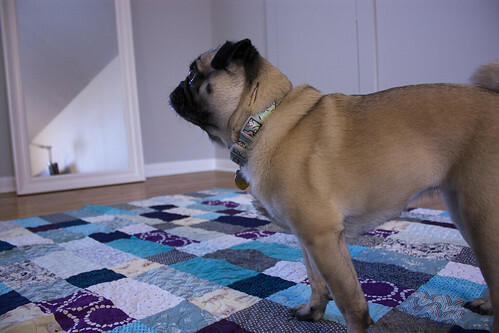 Once I'm about halfway through a quilt, a potential recipient comes to mind. While I was sewing the top for this one, it kept reminding me of my youngest sister, Rachel. She usually gravitates toward these colors and has even tried to steal a few fabrics from my stash that ended up in this quilt. 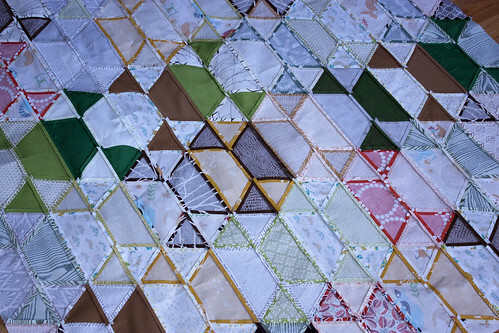 The large hexagons produced a lot of "waste" fabric, so I used the extra scrap strips to create a pieced back. My sister, Rachel, always house sits for us when we go away, so this was part of her gift for taking such good care of Koko, Nuku Nuku and our house. Our dear friends, Scott and Melissa, adopted a little baby boy last year and it took me until his first birthday to make him his own quilt. 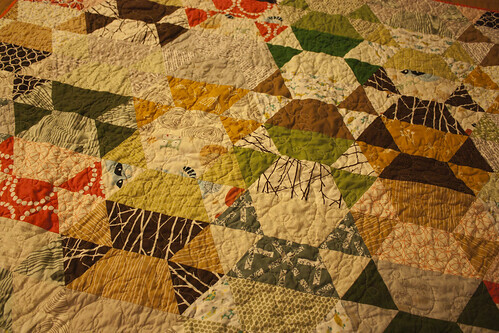 Scott and Melissa love nature and animals and camping, so I pulled together lots of fabrics with a woodland feel or palette into this quilt. 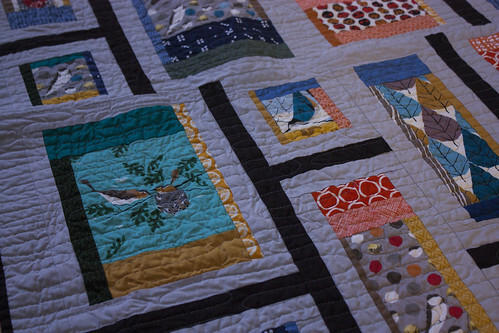 I added a bit of the fabric from our guest room, where they stay often, to the quilt as a little personal touch (the brown leaves on the top of the stack below). 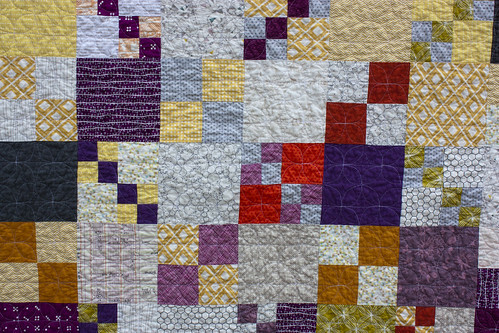 I used the Disco Quilt pattern from Jaybird Quilts and about 40 different fat eighths to make a scrappy patchwork quilt in the youth size. 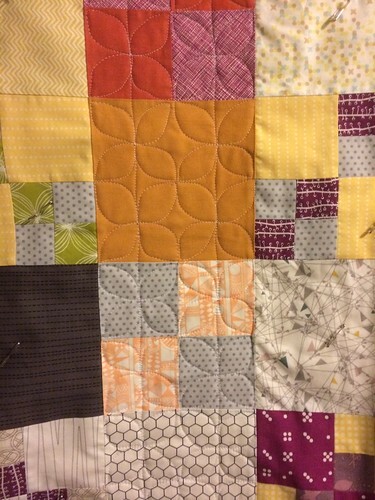 I'm pretty sure this was my first time pressing all seams open on a quilt. It definitely made for a flatter finished product without the extra bulk. My fingers didn't appreciate so many close calls with the iron, though! I must have taken the three below pictures in the middle of a blackout. 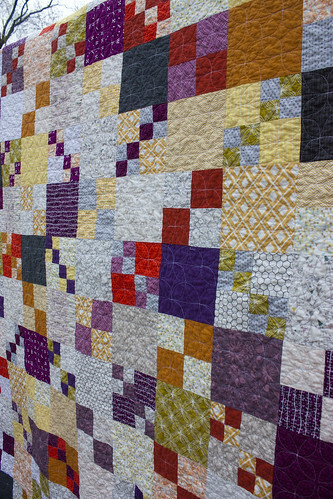 The colors in the top photos more closely reflect the true look of the quilt. 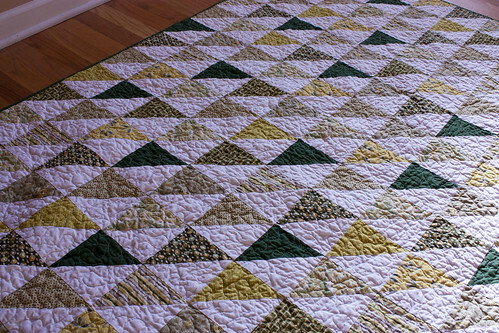 My one change to the pattern was to lop off the triangle points on the top and bottom of the quilt. I'm a fan of plain and simple edges. 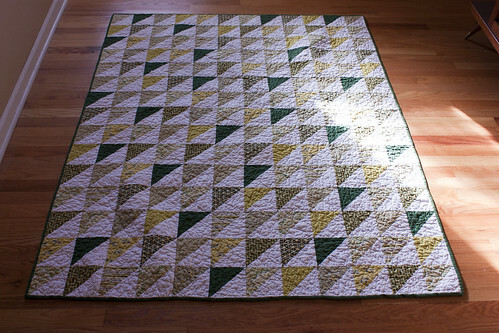 I quilted it with a meandering loop pattern. 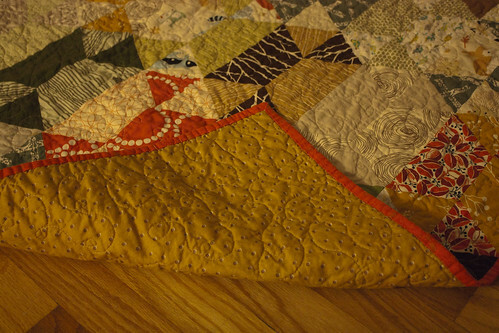 The backing is a gold Juliana Horner pattern from Joann and the binding is from the Botanics line. I fell in love with this Charley Harper fabric immediately, and I'm pretty sure I bought the entire collection the first day it was available. I didn't have a specific design or pattern in mind for it, so I searched for inspiration while waiting for the fabric to arrive. 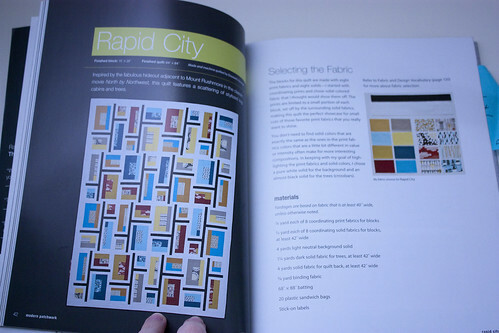 When I checked out Elizabeth Hartman's book, Modern Patchwork, I was immediately struck by her Rapid City Quilt pattern. The pattern's aesthetic fits perfectly with the mid-century modern Charley Harper fabric, so it seemed like a perfect pairing. 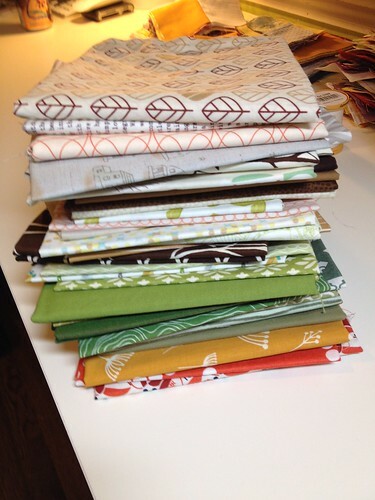 Knowing that I was going to use the entire fabric collection in one quilt, I wanted to add my own selection of coordinating fabrics to make it more custom. 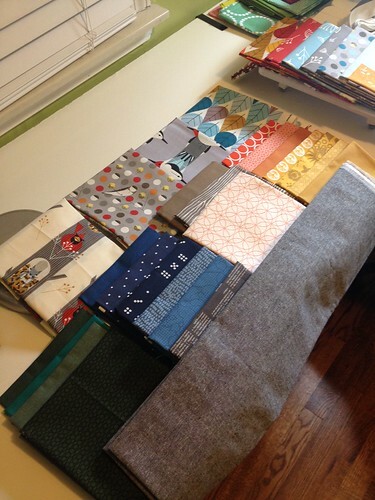 The fabric line has two different color stories (blue/grey and orange/red), so I was also hoping to use these coordinating fabrics to tie the entire collection together. Because the background grey that I used is very similar in value to some of the Charley Harper fabric backgrounds, I modified the pattern a bit. 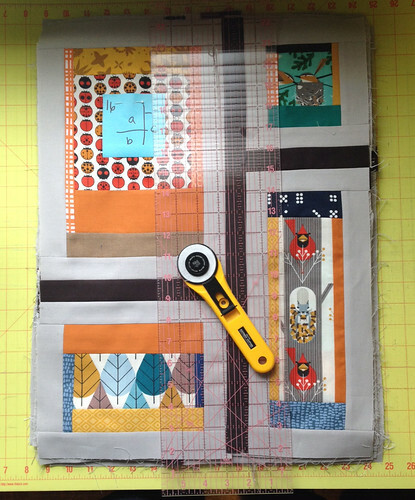 Each mini part of the block was fussy cut and the Charley Harper fabric was framed by coordinating fabric. 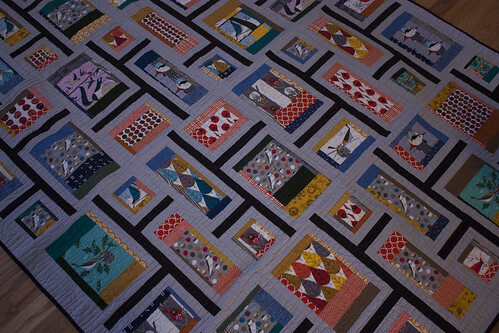 The pattern, as written, only used four pieces of fabric for each smaller part of the block. 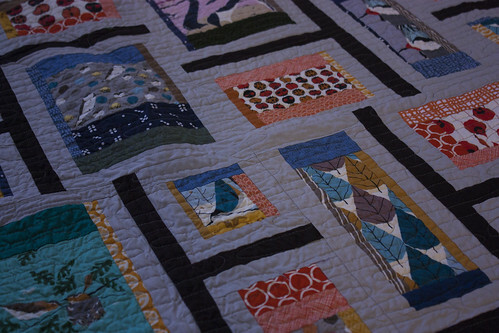 All of the rest of the dimensions in the quilt follow the pattern exactly. The backing also followed the pattern, with the fussy cut modification for the for parts of the feature block. 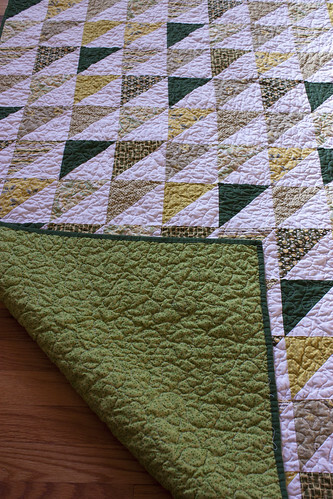 I followed the quilting guidelines in the pattern, which is based on Modern Quilt Studio's signature free motion pattern (also used previously on my Plain Spoken Quilt). I was nervous to start quilting this one, because it had taken so much time to develop the top and I was worried about ruining the overall design, but I'm super happy with the finished product! 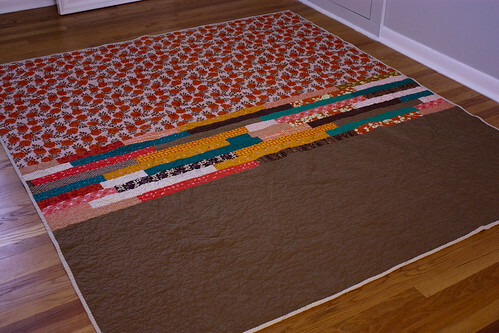 Putting this quilt together was so much fun. 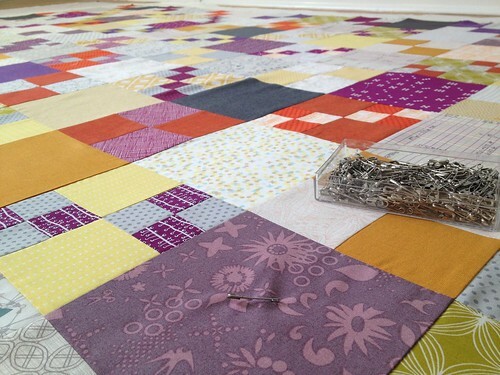 It felt like I was making 64 mini quilts as I worked on the smaller portion of each block. As the blocks were combined into larger pieces, it was great to see how everything was coming together and unfolding. Lots and lots of pressing and squaring up went into this. 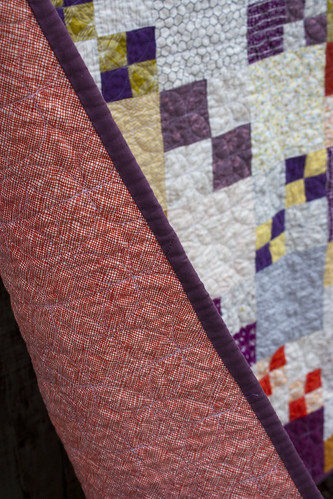 I've finally realized that taking time to properly press and square up smaller portions of my quilts results in a much neater finished project and makes everything so satisfying! 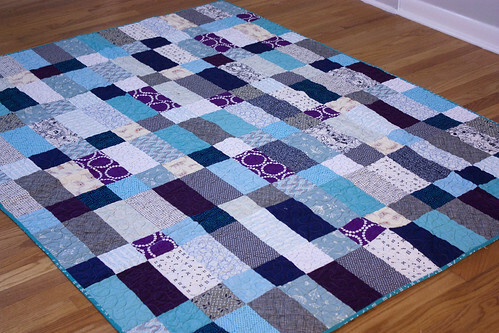 It was definitely time consuming, but I've found that the quilts for which I put in the most work, are usually my favorite.